Back in the Seventies, Barbra Streisand attempted to become a rock star. Actually, �rock star� is a bit of a stretch, as it�s not like she pursued anything particularly intense; Babs stayed with light pop music. Nonetheless, she stretched beyond her usual adult contemporary roots and attempted material with a more current sound for the era. 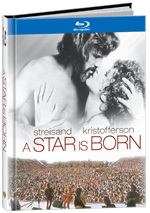 As part of this move, Streisand starred in a rock-oriented remake of A Star Is Born. 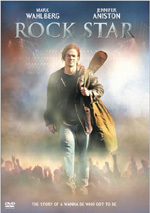 The 1976 flick introduces us to rock star John Norman Howard (Kris Kristofferson). He engages in substance abuse and shows up hours late for his own performances. Years of this sort of behavior has left his star on the wane despite the best efforts of his road manager Bobby Ritchie (Gary Busey) to get him back on track. If you look through Streisand�s films, one recurring thread appears: many of them seem to exist largely for the Glorification of All That Is Babs. In the case of Star, this means the film holds her up as a paragon of everything right and beautiful in the world. Love her or hate her, Streisand�s basic talent can�t be denied. However, one can deny that she deserves the God-like status she tries to confer on herself. At best, she seems self-involved, and at worst, she comes across as a raging narcissist. This means that we have to accept Esther as a world-class beauty, and that�s absolutely impossible to do. John ladles praise on Esther for her looks, all in what appears to be an attempt to hoodwink the audience and make us agree with him. That never happens. Though her silly Seventies perm doesn�t suit her well, Streisand wasn�t an unattractive woman. However, she�s not nearly hot enough to dazzle anyone, especially a rock star like John who�s certainly conquered many much sexier women. This leap of faith causes one major problem with Star, but it�s not the film�s fatal flaw. Its greatest drawback stems from the simply fact that it�s dull. Painfully dull, as a matter of fact. The story moves at a snail�s pace and takes forever to get anywhere. If it used that time for character development, I could accept the dawdling, but it never manages to invest its roles with any real depth. In all the time it takes, we never really get to know our leads, and we certainly don�t care about them. The film�s atrocious music doesn�t help. Streisand�s pop-rock career was mediocre at best, but I reserve the greatest animosity for the tunes that it sticks on Kristofferson. John�s supposed to be a rock legend but he gets material without much more edge than Streisand�s pop trifles. John�s tunes are laughably bad and take the viewer out of the story; it�s impossible to believe miserable material like that could have made anyone a star. This issue becomes more substantial just because Star packs its elongated running time with tons of musical sequences. We get stuck listening to these terrible tracks forever and ever, and they make a tedious tale proceed at an even slower pace. The music made by Esther results in much unintentional comedy, though. Take the scene when John headlines a concert but halts it so Esther can take the stage instead. In front of a crowd there to rock, she belts out her light pop and enchants each and every one of them! As they say: yeah, right. If an unknown singer who performed songs like that played in front of a drunk/stoned/God knows what else � and already angry � rock audience, there would�ve been riots, not rapture. But as always, we�re supposed to believe that Streisand�s talents heal all. Star suffers from a rambling, bloated story with little drama or anything to interest us. It�s an awful vanity piece. 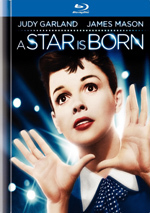 A Star Is Born appears in an aspect ratio of approximately 1.85:1 on this Blu-ray Disc. Star provided a consistently good visual experience. Sharpness looked pretty solid. A little softness affected some close-ups, a fact I�d guess came from �glamour� photographic techniques, and a few other �off� shots occurred, such as a blurry sequence when Esther and John write a song together. Those created minor concerns, though, as the movie was usually concise and accurate. Jagged edges and moir� effects created no concerns, and I also detected no signs of edge enhancement. Despite the age of the movie, it seemed surprisingly free of defects. A couple of tiny specks popped up but nothing more than that. Colors stood out as positive. Within the production design, the hues came across as rich and distinct. I noticed no issues related to bleeding, noise, or other concerns, as the tones were lively and dynamic. Black levels were deep and rich, while shadow detail looked clean and clear; a few nighttime shots could be a bit dense, but those were mild distractions. Nothing substantial marred the presentation so I thought it was a solid �B+�. As for the DTS-HD MA 5.1 soundtrack of A Star Is Born, it presented a distinct series of highs and lows. On the positive side, much of the music sounded very good. The tunes boasted nice stereo imaging, and they often showed solid dynamics. Though a few of the numbers were a little lackluster, most demonstrated fine clarity and range. The music acted as the clear highlight of the mix. As for the negatives, I�d focus on everything else. Speech tended to be dinky and distant. I often found it tough to hear what the actors said and found the quality of the lines to seem thin at best. This was more of a problem with the mix than with the original recording, though; the balance buried the lines and could make them difficult to discern. When dialogue stood on its own, it seemed more natural, though even those moments were up and down; for every concise line, we got a flat, distant one. Effects usually sounded wan and without much definition. Since they played a small role in the proceedings, that wasn�t as much of an issue as the poor speech, though. Effects usually stayed focused on the front center, though some elements like crowd noise and rain spread to the rear. These elements tended to seem thin and distant. Other than the music, this wasn�t an ambitious mix. And other than the music, this wasn�t a good mix. The high-quality tunes earned a �B+� but the rest fell into �C-� range, so I ended up with an overall �B-�. How does the Blu-ray compare to the prior DVD? Audio is a little warmer and fuller, but both suffer from similar drawbacks. Visuals show an improvement, though, as the Blu-ray brings us the standard step up in terms of accuracy and color reproduction. I felt pleased with the DVD�s picture quality but the Blu-ray easily tops it. The Blu-ray replicates the DVD�s extras and adds one new one. The prime attraction comes from an audio commentary with actor/producer Barbra Streisand, as she offers a running, screen-specific discussion. Streisand covers how she got into the project and her role behind the scenes, casting and the other actors, music and performances, cinematography, editing and costumes. In addition, Streisand devotes much of the discussion to the Woes of Fame. She often notes how difficult it is to be a star, and she really sounds whiny. I understand her complaints but geez, she�s been a major star for five decades, and I�d think she�d be over all these issues by now. I can�t imagine hearing McCartney or Jagger gripe like this. Streisand manages to provide some nice notes, but the mix of drawbacks makes this an erratic commentary. We hear more from Streisand during three minutes and 12 seconds of Wardrobe Tests. Streisand narrates the otherwise silent footage and gives us some notes on what we see. The footage is moderately interesting as it shows ideas for outfits, and Streisand�s remarks add a few useful bits of info. 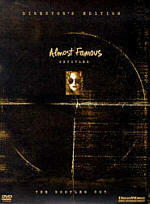 12 Deleted Scenes run a total of 16 minutes and 44 seconds. Most of these pad out the John/Esther relationship, and virtually all of them seem redundant. We get the needed information in the final film, so none of this material would have contributed to matters. You will find unintentional comedy, though. We get alternate angles of the movie�s concluding musical performance. Streisand�s insanely emotive rendition of the tune is bad enough as viewed in the flick, but here we see her go fully epileptic. The horror! The horror! New to the Blu-ray, we find a hardcover book. It includes a mix of production notes, cast/crew info, and a variety of photos. It adds a little value to the package. Back in the Seventies, many regarded the 1976 A Star Is Born as a misfire, and nothing has changed perceptions over the last 37 years. Tedious, boring and bloated, the flick exists as a love letter to its star and nothing more. The Blu-ray presents pretty good picture, erratic audio and a moderately useful set of supplements. I feel pleased with this release but as a movie, A Star Is Born offers a dreadful vanity piece.